On the 21st December 2008, my lovely 19 year old daughter Rosie died suddenly from septicaemia. In memory of Rosie a charity fund has been set up. 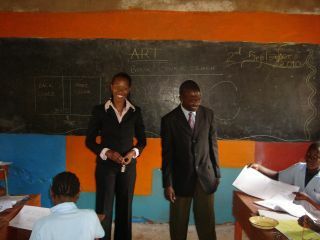 As Rosie lived life in glorious technicolor, through the charity Ace, in memory we want to share some of that colour by sponsoring an art & crafts teachers at the South End Academy North Kenya. At the school sustainable craft skills will be taught. Our aim is to fund this education for as many years as possible. The majority of the children who will benefit have been orphaned by HIV and/or AIDS, but thanks to Rosie's fund, they will be able to learn new skills to enable them to earn a living and break out of the destitution that is the fate of many millions of children in sub-Saharan Africa. A lesson taking place in the Southend Academy (Sept 2010). The support of the fund has been overwhelming, but we don’t want to stop there!!! I can assure you that all the money raised is going to a really worthy cause and knowing that orphaned children in Africa will receive an education in tribute to Rosie is a big comfort. It is really heart-warming when friends give something as it means I know Rosie has touched your lives too in some small way. Please be generous, your donations whatever the amount will make a big difference to so many people. Smashing the fund raising target would be a great tribute to Rosie, so please support this campaign and of course spread the word to others. A huge thank you for all your love, support and generosity! To view more photographs of the ambulance (sent to us from the Starfish Clinic Project International) and the Southend Academy (supplied by ACE), access the charity photograph gallery by clicking on this CHARITY PHOTOGRAPHS link. Donating through Justgiving is quick, easy, totally secure and the most efficient way to sponsor Rosie's fund. Action in the Community Environment (ACE) gets your money faster and, if you’re a UK taxpayer, Justgiving makes sure 25% in Gift Aid plus a 3% supplement, are also added to your donation.